Have you ever wanted to host your own game show at home, at parties or at the office? With Greggo's Game Shows' software, you can! 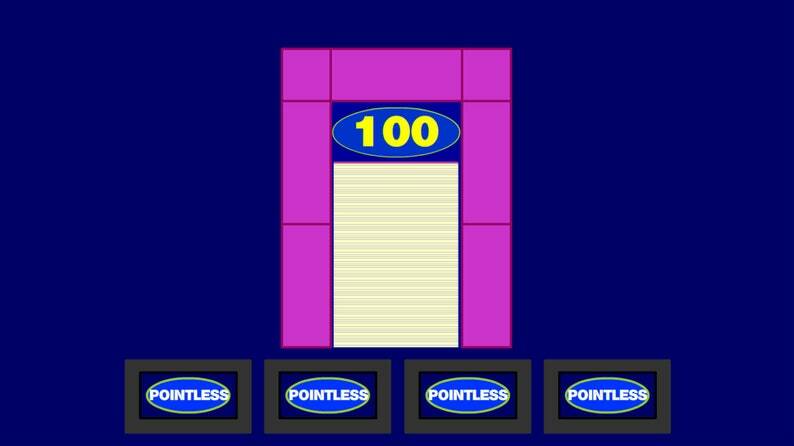 This software replicates the meter and scoreboards for the popular UK game show Pointless. This is not a game; it is merely presentation software that, when used with your own survey questions and answers, can be used to recreate an authentic experience similar to the television show. I've been hosting game shows for conventions and other special events since 1999, and I'm making some of my presentation software available for you to use for your own events! In order to utilize this software, you'll need a Windows-based device with Flash Standalone Player installed. Instructions on how to acquire this player are included in the software's instructions. *This program REQUIRES a native Windows environment. It will likely not run properly on Windows emulators for Mac or iOS devices. Please do not purchase this software if you plan on using it on a Mac or iOS device. Upon purchase, you will receive all files required to run this presentation software, including the text files you will want to customize to make your own game of Pointless for the home, office, event or classroom. You will also receive e-mail support to ensure you get the game up and running for your event or Twitch stream.